← Hey, Murphy….are you calling me a spud? Many moons ago, I happened on an ad for a remainder bookstore located in Falls Village, Connecticut. Falls Village, in 2010, had a population of 538, so it is not exactly a huge metropolis, however, one of the best booksellers in the world (in my humble opinion), resides there: Edward R. Hamilton Bookseller. Now, I have been ordering ridiculously low priced new (a few may be “shopworn”, but these are relatively scarce) books from Mr. Hamilton for many years. I have purchased the occasional “non” cookbook, but by far, 95% of the books I purchase are cookbooks. They offer specialty catalogues, and when the “Cookbook” catalogue arrives in the mail (also available online), I might as well be a five year old let loose at Toys R’ Us! Not only are the books priced so low, but if you pay by cheque and send in the order form, you can purchase AS MANY BOOKS AS YOU WANT FOR $3.50 SHIPPING! How can you beat that? Ordering with a credit card online is a bit more expensive for shipping, but not much. One time, I placed an order (by cheque) for about 55 books, which arrived in 3 separate cartons, but I still only paid $3.50 shipping. I don’t know how they do it. 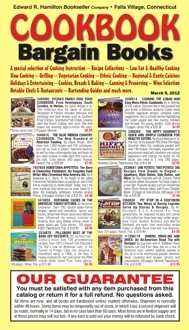 A couple of weeks ago, I placed an online order with Mr. Hamilton, for 19 cookbooks. I anxiously visited my post office box on several occasions, awaiting the delivery of my treasures. Finally, a day or so ago, I found a box waiting for me, however, it was not the usual sturdy packing box they use, but was a recycled box (rubber gloves were the former occupants), very lightweight and with a label, which indicated “repackaged in Denver USPS”. Inside were some remnants of packing material, my shipping list, and only 6 books, of which 2 were damaged. I was crushed (as were 2 of the books). I knew this was not the work of Mr. Hamilton, but looked more like careless handling on the part of USPS. Where the 13 missing books are is anyone’s guess. USPS included a form for “mail recovery”, which I completed, however, they indicate it will take 90 days to complete their “investigation” and they will not contact me, nor is there any phone number I can contact for a status report. I believe that USPS doesn’t really want my business, even though my tax dollars help to support them. In addition, they apparently will not even bother to search for any missing mail, unless the “lost” items have at least a value of $25 (too much trouble for them, I guess). Enter Edward R. Hamilton, once again. I e-mailed them (certainly won’t send a snail mail any more!) about my plight, indicating that there was nothing they could do about my lost books, as I paid for them in good faith, and also in good faith, they shipped them to me, which they have been doing regularly for years. I only wanted to let them know that USPS might not be their friend and that perhaps they should start looking at alternate shipping options. To my surprise and delight, a customer service representative replied promptly that Mr. Hamilton was going to replace all 13 of the lost books, plus the 2 damaged ones. They asked for no returns of the damaged items, and would also cover the modest shipping cost. Now, I ask you, in this day and age of indifference, rudeness, “whatever”, and generally unbelievably bad customer service, is this not stellar? They offered to make up the deficit for the apparent mishandling by USPS, which they were certainly not obligated to do. Mr. Hamilton, I tip my hat to you and your staff! Now, everyone who loves books at bargain prices, with ridiculously low shipping charges, run, don’t walk to your computer and check out: http://www.hamiltonbook.com/ ! Tell them Sue sent you. You won’t be disappointed. This entry was posted in Cookbooks, Cooking, Uncategorized, Vintage Cookbooks and tagged cookbooks, Cooking, CT, Edward R. Hamilton Bookseller, Falls Village, Remainder Bookstores, Sue Jimenez, Vintage Cookbooks. Bookmark the permalink.